Q: What are the Rules Of Texas Hold'em? A: Please view our Texas Hold'em page. Q: What are the Rules Of Pot Limit Omaha? Q: Can I Start Playing Poker On PokerBaazi Now? A: To start playing right away on the Internet browser click on the INSTANT PLAY button in the website or Download our free poker software. Q: I am Faced With a Difficult Decision In a Poker Hand, Do I Get Additional Time? A: If a player doesn't act in his given time period then some additional time will be given to the player to act. After every 50 hands, some additional time is added to the player's time bank. If the additional time is 0 and the player does not act on his turn, then the player will be automatically folded. Q: How Does Auto-Muck Work? The player who took the last aggressive action in the hand will show his hand first. If the aggressive player is the winner then the other player/players in the hand can muck their hand. If the aggressive player losses the hand then the aggressive player's hand will be shown first and then the winner's hand is shown. If everybody has checked on the river, then the first active player to the left of the dealer will show the hand to the table first. If the next active player has a better hand than the previous player, then he/she needs to show the hand to the table or else if they are losing (with reference to the all previous players) the hand will be automatically mucked and this sequence will continue for all players. Q: What is Straddle? How Does it Work? Straddle is a forced blind, double the big blind amount and is always put before the cards are dealt. It's allows you to act last in that round where players wanting to enter have to at least call your blind raise, giving you the option to raise your blind raise, re-raise a raiser, check, or fold. Straddle will only have an impact on the game pre-flop. Pre-flop, the minimum call amount is the straddle amount if the straddle check box is enabled. After the flop opens, the minimum bet amount will be the big blind amount. Straddle cannot be done on the dealer button. So straddle can only be posted if 4 or more players are involved in a hand. Q: How do I allow popups? By default, Google Chrome blocks pop-ups from automatically showing up on your screen. When a pop-up is blocked, the address bar will be marked Pop-up blocked . Click on this icon to allow popups from PokerBaazi and reopen the game lobby. If is still does not work, you may follow the below steps. At the top right, click More Settings ----> At the bottom, click Advanced. -----> Under "Privacy and security," click Content settings. ----> Click Popups. ----> At the top, turn the setting to Allowed. When blocking a pop-up, Firefox displays an information bar (if it hasn’t been previously dismissed – see below), as well as an icon in the address bar. On the Privacy tab, under Pop-up Blocker, clear the Turn on Pop-up Blocker check box, and then select OK.
Click the Internet Explorer icon on the desktop to open the program. Click the Tools button in the toolbar at the top of the browser window. Click the Privacy tab in the Internet Options pop-up window. Clear the check mark next to "Turn on Pop-Up Blocker" so that it is deselected (see Figure 1). Click Safari in the browser menu, located at the top of the screen. Choose Preferences when the drop-down menu appears. You can instead use the Command+Comma (,) shortcut keys in lieu of clicking through the menu. Click the Security tab to open the Security Preferences window. 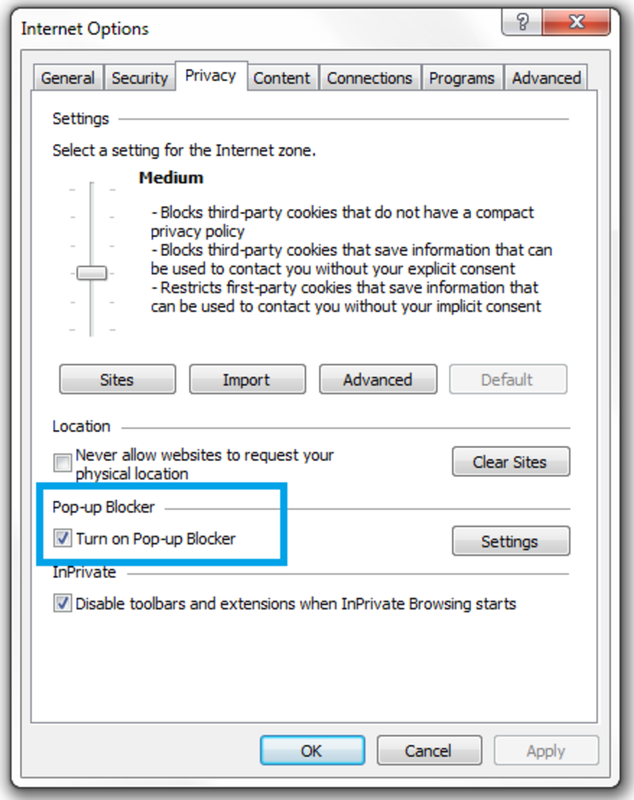 In the Web content section, clear the check box next to the option called Block pop-up windows. Q: How Do I Know that the Shuffle is Fair? A random shuffle is a fair shuffle. The "shuffling" is actually a carefully-designed computer algorithm performed by our poker server. We have taken a number of measures and external audit to make sure the shuffle is fair. RNG used in Pokerbaazi.com has been audited by BMM Test labs a leading global agency and one of the longest established and most experienced private independent gaming certification lab in the world. Q: What Happens If I am Disconnected in the Middle of a Hand? It is possible to get disconnected from the game due to unavoidable reasons and its player's responsibility to have good internet connections between player computer and our servers. In order to protect player's game play we at PokerBaazi have a disconnection timeout that gets activated and a status message displayed as "disconnected" on players seat. Once the player is reconnected the player will receive some additional time to act on his / her turn if the timer was already running. If player does not act within the allotted time after connecting to the game, the hand will be folded. There is no extra time provided in tournaments and cards will be dealt to disconnected players blind and/or antes will be posted as well. There is no rule against a single player choosing to sit out in a tournament; the player doing so will continue to have blinds and antes posted and cards will be dealt. Q: What Happens if the System Crashes in the Middle of a Game? A: In such a scenario the system will rollback the last hand of the player and the chips will be refunded to the amount at the beginning of the hand. Does the Poker Software Allow Me to Muck the Winning Poker Hand? A: No, it doesn't. If you play your hand to the showdown and you hold the winning hand, it will always automatically be shown. This feature protects you from accidentally mucking a winner. Q: How do I Earn VIP Points? What are their Benefits? A: VIP points are awarded to the player by their contribution to the website in the form of rake in cash games, entry fees in tournaments and Sit & Go's. By accumulating VIP points, a player can move towards higher VIP levels. As you move up the VIP ladder, the website rewards you with bigger cash rewards. Please view our Baazi VIP Club. Q: What is NOTES in the Chat Window? A: This feature enables the players to write notes about other players. These notes are stored and can be viewed in the future. Once a note for a specific player is made, 'N' appears under the player's avatar. Notes for Texas Hold'em and Omaha are stored separately. Q: What is Real Cash Bonus? A: Real Cash Bonus are promotional chips which can be used on Cash Games. It cannot be used for tournament buyins. The Real Cash Bonus gets converted to withdrawable balance as you use it on the cash tables. Dependng on the stakes you are playing and your Baazi VIP Club level, these chips keep getting converted into wthdrawable balance. Q: How Do We Get on the Leaderboard? A: LeaderBoard is a real-time skill calculator that takes into count every tournament that you play. LeaderBoard is updated once everyday at 7 AM. For VIP tournaments 1 VIP Point is counted as 0.617.